Ministerial Committee for Legislation to discuss proposal to raise penalties for unlicensed tour guides; many tours give false information. MK Tali Ploskov of Kulanu has proposed a bill to make the penalty for working illegally as a tour guide more severe, citing serious damage to Israel's global image as part of the necessity for new legislation. "Tour guides in Israel have a tremendous impact on the fight over Israel's image in the world," the MK said, "Unfortunately, there is a widespread phenomenon where people pretending to be licensed tour guides present a twisted picture to tourists coming to Israel. The damage caused by this is twofold: work is taken away from actual licensed guides who've passed the Tourism Ministry course, and false facts about Israel are spread. The bill I have proposed would make penalties for impostors higher and enable effective enforcement." Ploskov is referring to the proliferation of tours organized by anti-Israel NGOs which give visitors the impression that Israel is a brutal occupying regime by repeating discredited myths about treatment of Palestinians by the IDF, and other distortions of the historical record. The law currently in force for penalizing unlicensed tour guides is very old, as evidenced by the fact that the stipulated fine is in Liras, the currency that was replaced by the Shekel in 1980. Chairman of the Israel Tour Guide association Benny Kfir praised the bill: "A law that imposes a 20,000 Lira fine for unlicensed tour guides should have been changed long ago. We thank MK Tali Ploskov for initiating this proposal, and we're sure that all who care about Tourism in Israel will vote in favor of this bill in the Ministerial Committee for Legislation. "Nearly 50% of tours today are led by unlicensed guides," Kfir continued, "this illegal activity causes an estimated 1.5 to 1.8 billion NIS of direct damage to the licensed guides, and the state loses over 2 million in tax revenue as well. Beyond the matter of the numbers, we are talking about honest people who fight for a living day after day in a fragile tourism industry constantly threatened by terror events." 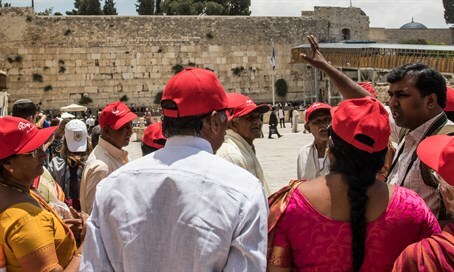 An estimated 5,000 legally licensed tour guides are currently active in Israel. By law, only guides who've earned a license by passing a course supervised by the Tourism Ministry may lead tours. The illegal guide phenomenon hurts Israel's image in the world as the situation is often exploited by various elements to spread anti-Israel propaganda. The lack of professionalism and knowledge exhibited by unlicensed guides also hurts the Israel tourism product more generally, adversely affecting the economy. The bill that will be discussed in today's (Sunday) meeting of the Ministerial Committee for Legislation proposes raising the fine to 5,000 NIS for a private individual, and 50,000 for a corporation. The prison term for violation of the law would also be doubled from six months to a year. MK Ploskov hopes that these measures, if adopted, would deter continued violation of the law and the spreading of a twisted picture of reality in Israel.